Since the devastating Sandy Hook shooting in December 2012 left 20 young children and 6 adults dead, at least 44 more school shootings have occurred. An aura of shocking and seemingly senseless violence continues to haunt the landscape of the United States. The problem of violence plagues almost every corner of our society: public schools, malls, college campuses, movie theaters, and — sadly — even homeschools. Parallel to cases of public school students gone awry are cases of homeschooled students. These cases are just as heartbreaking and can be just as violent. Unfortunately, the knee-jerk reaction of homeschooling communities is often to respond defensively after these situations, to focus on how the cases are portrayed in the media rather than to consider what lessons may be learned from them. This defensive reaction is not only unfortunate, it is misplaced. (So too is using violence as a marketing tool, as Howard Richman from PA Homeschoolers did after the public school massacre in Littleton, Colorado, when he declared that, “with the increase in school violence we have a new bumper sticker, ‘Homeschool: The Safe Alternative. '”) Knee-jerk defensiveness hinders homeschooling communities (and larger communities) from providing an honest self-assessment of what can be done to prevent further situations of similar personal, communal, and institutional breakdown. These questions need to be asked just as diligently and earnestly by homeschooling communities, co-op teachers, and parents. We need strong, brave individuals to stand up and speak out about the importance of mental health care, about the impact dehumanizing and stifling ideologies and discipline practices have on children, and the real psychological results isolation can have on a person’s developing psyche. These are not questions we can continue to avoid. The number of homeschooled children that have grown up to become violent criminals, mass murderers, even serial killers, is growing. In many cases, these are not simply small-time killers. We have one of the most notorious white supremacists on our hands, along with the leader of a conspiracy to overthrow the U.S. government and assassinate the President and the most famous serial killer of the last decade. We must take these cases seriously as a community. Innocent lives have been lost. Families have been torn apart. The time has come for honest assessment and serious discussion. We include as “homeschooled” any individual who was home educated when the event in question happened, was home educated for a substantial amount of time, or was home educated in a way that significantly impacted the individual in a documented, explicit manner. We have created this archive to document and describe. We are not making any statistical claims. We will not seek to make interpretations or arguments within any given entry. Readers are free to draw their own conclusions or recognize patterns for themselves. This is not a complete archive. The cases we have collected do disprove Brian Ray’s claim that “the general-population teen [in the 14-17 year old age group] is 2,500 times more likely to commit homicide than a home-educated teen.” However, they do not actually tell us just how likely (or unlikely) homeschooled teens are to commit homicide. In creating this archive, we do not claim that homeschool students and graduates are any more or less violent than individuals otherwise educated. Making such a determination would require a much larger research study than we are capable of conducting with current resources. We do not think that whether homeschooled students or graduates are more or less likely to become violent is relevant to our contention that homeschooling communities need to be aware of the risk factors that may lead to such violence in their own communities and take steps to address them. Our purpose here is to archive, to remember, and to mourn — and ultimately, to present a case for action. We will release 3-4 cases each weekday for the following two weeks. Cases will be released in alphabetical order according to each individual’s last name. At the conclusion of the two weeks, we will release one large document that includes this introduction, all the cases, our concluding thoughts, and a timeline. Please know that the details in many of the cases are disturbing and graphic. If you experience triggers from descriptions of physical and sexual violence, you may want to avoid reading these cases. I have followed your blog for several months now, and have been moved, saddened, and gained perspective from many of the stories shared. It’s been very eye-opening to read the first-hand accounts of those on the receiving end of home ed, which has been instructive and led to some very honest and open conversations with our teens. It is my hope that justice will be served for those who have been abused or neglected, and that healing will take place in their lives. However, I have an observation related to your current series of reports, which have taken a turn from posting first person accounts to news items, in which you are pointing out that homeschooling was one common factor in the lives of the criminals. Of the accounts you have posted, yes, homeschooling is a common factor (of many possible factors) in these stories, but with rare exception, could not be considered as a primary cause of the crimes committed. 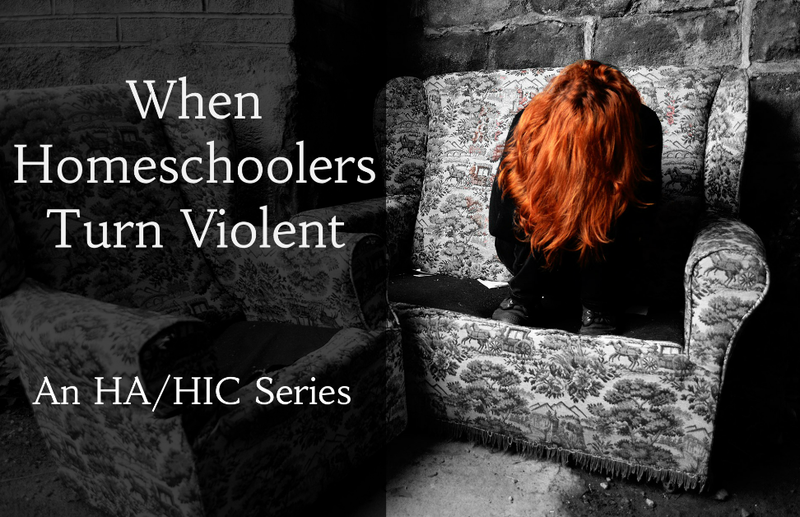 In many of these cases, homeschooling was not even a major influence in the childhoods of those who resorted to acts of violence, but rather a desperate attempt by well-meaning parents to help their troubled children after other efforts had been exhausted. IMHO, I see mental illness and/or abusive environments as bigger key players. In conclusion, you have done an excellent job of giving those who were previously silenced a voice, and of addressing subjects often considered taboo in conservative homeschooling circles. But, I am concerned that the current series overemphasizes the role of homeschooling in the lives of those who attempted or committed violent crimes. Homeschooling is not a panacea to solve all social ills as some believe it to be, but neither is it necessarily the proximate cause of the violent actions described in this series.